I really wish I could talk about something else besides the weather because it’s usually a lazy go-to topic, but you guyssss! It’s fall! It’s finally fall. I’m too excited not to talk about it. 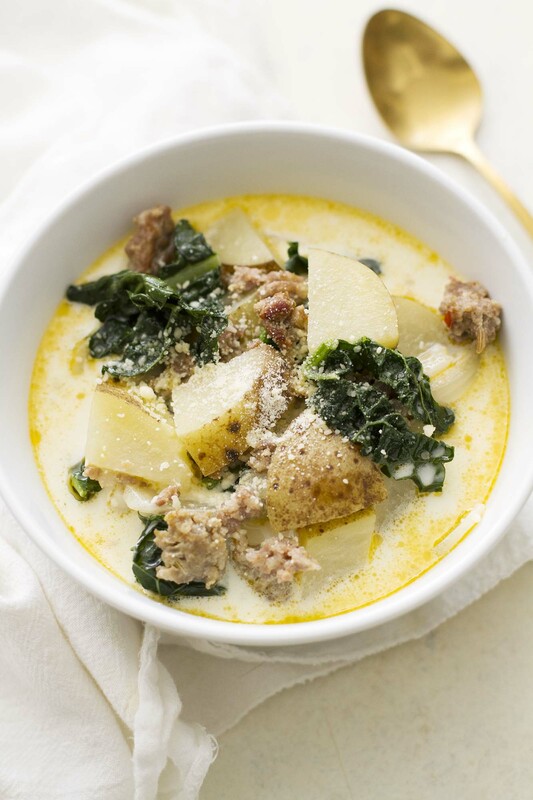 The air is crisp, the leaves are changing, we have plans to go apple picking this weekend and all I want to do right now is cozy up in a sweater and a scarf and enjoy a warm bowlful of this slow cooker zuppa toscana. YES x 1000. This is my spirit season. I’ve lived in the Midwest my entire life and whenever I think about moving somewhere that’s consistently warm throughout the year because I sometimes (always) majorly dislike the frigid cold, I remember this exact time of year. I remember how much I love how clear the air is, how the morning sun gleams off the golden leaves still clinging to trees, how I can wear any one of my two-dozen scarves (ummm hai I have a secret scarf problem) and pair them with my leather boots and a hot apple cider in hand. I suppose I could do that in a warmer state, too, but I might sweat to death and get weird looks. Here, however? It’s perfect. In September, I know I am meant to be here. I also know that in September, I am meant to make all the slow cooker soups. It just seems like the right thing to do. 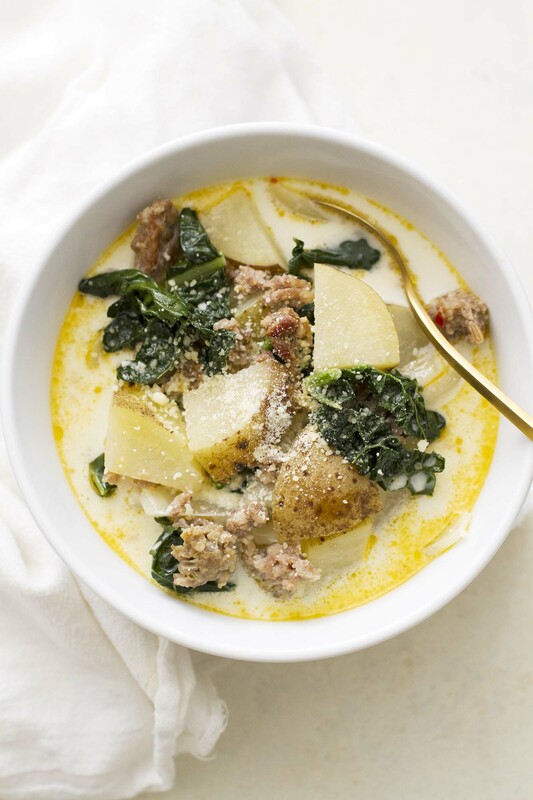 And this slow cooker zuppa toscana is no exception. 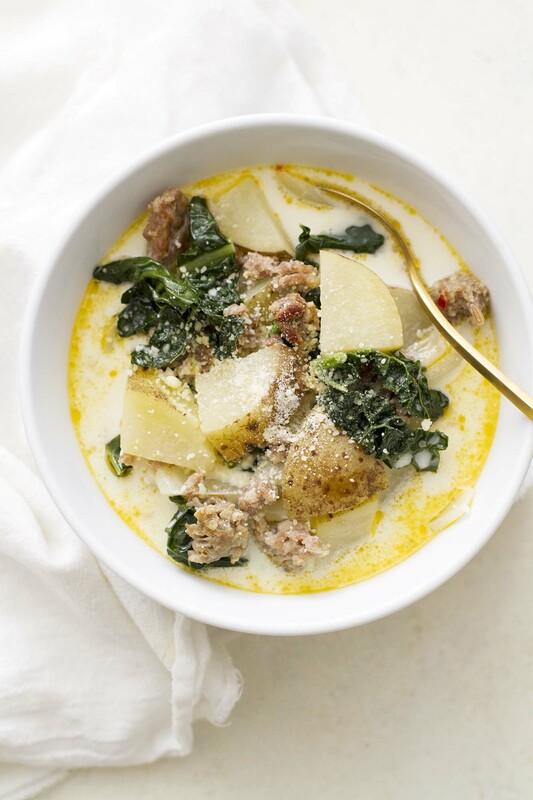 Truthfully, I have never made zuppa toscana before, but I had heard of it — a comforting combination of Italian sausage, potatoes, kale and cream — and I knew it had to happen in my kitchen. The slow cooker seemed like the best way to bring it into existence, too — minimal prep and cleanup, and no babysitting the stovetop. Gives me more time to sort through those scarves! Ahem. So here’s basically what you do: You brown the sausage on the stove, then add it to your slow cooker with some chopped potatoes, chicken broth, garlic and onion. Let everything cook and make merry for a few hours until the potatoes are tender, then stir in some kale (I used Tuscan kale here to be extra apropos, but curly kale or even Swiss chard works well, too) and cream (obviously) and let it all cook together until the kale is wilted. Ladle into bowls, sprinkle on some Parmesan cheese, add a chunk of crusty bread and cozy up to your new favorite cool-weather meal from a crockpot. Plans for today: Eat this soup. Maybe organize those scarves. Enjoy the fall weather. Repeat. Heat large skillet over medium-high heat. Cook sausage, breaking up with wooden spoon into small pieces, 5 to 7 minutes until cooked through. Drain. Add cooked sausage to 6-quart slow cooker along with potatoes, onion, garlic, chicken broth and a generous pinch of salt and pepper. Stir to combine. Cover and cook 4 to 5 hours on High or 7 to 8 hours on Low until potatoes are tender. 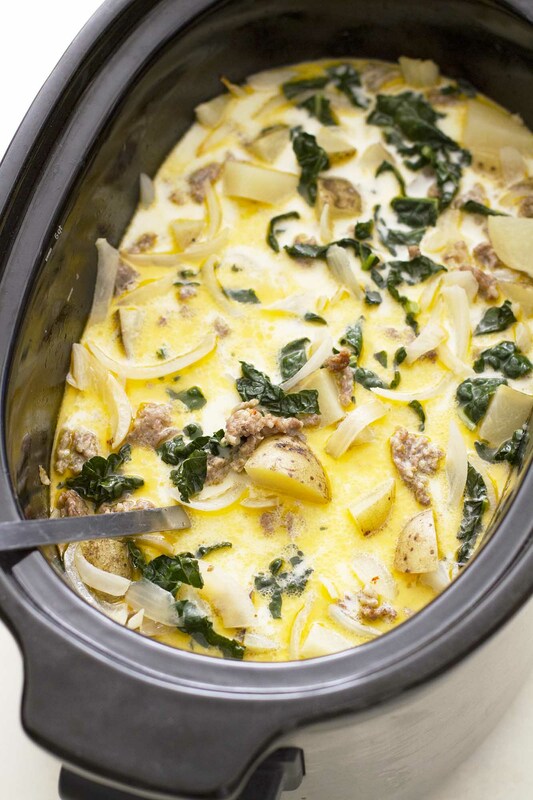 Add kale and heavy cream to slow cooker; stir to combine. Cook another 20 minutes until kale is wilted. Add more salt and pepper to taste, if needed. Serve soup with grated Parmesan sprinkled on top and a side of good crusty bread. Looks sooooooo good. My favorite time of year too! Everything I want and more right now…. Are you sure there’s no butter in this recipe? The photos appear to have butter floating on top… Sure looks yummy!!! Heather — So deceiving! 😉 Thank you! Probably the fat from the heavy cream. Very comforting recipe in front of the fire! Unfortunately I’m heading into Summer! This looks like such a delicious dinner! 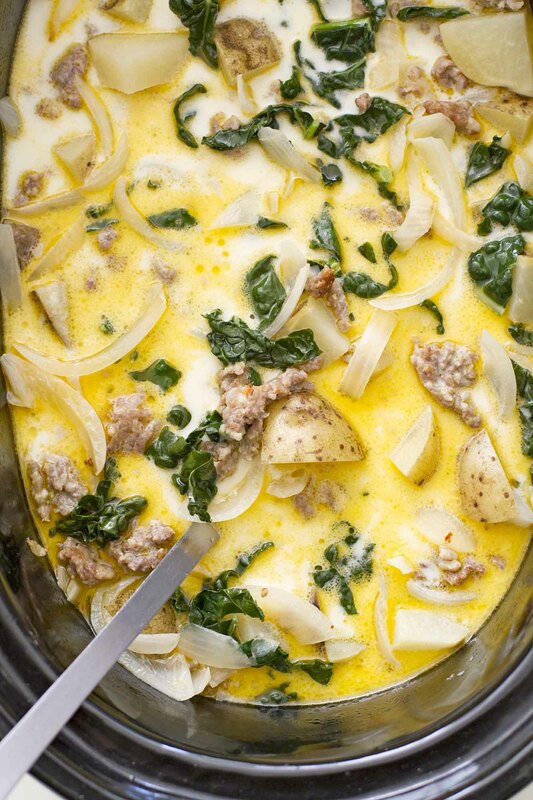 I love zuppa toscana but haven’t tried making it myself before!